It’s happening. Super-slim Ultrabook prices are edging closer to the average range of standard laptop prices. For instance, Lenovo IdeaPad U-series Ultrabooks officially announced on Wednesday start at $749, and other Ultrabooks announced by Asus, Sony, and Toshiba are also more moderately priced, starting at just $600--with some tradeoffs, of course. So far, price has been the major barrier for Ultrabooks, the new class of laptops designed to balance portability, power, and price. Most of the first wave of Ultrabooks had a $900-to-$1,000 (or even higher) starting price, so compared to many laptops selling for around $500, these ultrathin laptops haven’t been widely received as great bargains. 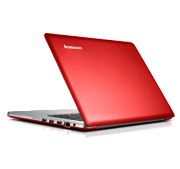 The recently announced Lenovo IdeaPad U310 and U410 Ultrabooks start at $749 and $799 respectively. For those prices, you get the latest Intel “Ivy Bridge” Core processors, long battery life, and a thin and lightweight aluminum chassis. The 13-inch U310 boasts a 7 hour battery life, 0.7 inch thickness, and weight of 3.47 pounds. Meanwhile the 14-inch U410 may last up to 9 hours on one charge, is 0.83 inches thick and weighs 4.18 pounds. They’re not the lightest, thinnest, or most beefed up Ultrabooks we’ve ever seen, but the new U-Series are stylish and more affordable than most others we’ve seen recently, including Lenovo’s original IdeaPad Ultrabook, the U300s, which started at the incredible price of over $1500. The lower U-Series prices are due in large part to the use of a traditional hard disk drive (500GB) instead of a more expensive solid state drive. (A faster 32GB SSD is also available in the new Ultrabooks to speed up boot times). Lenovo isn’t the only one breaking the $800 price barrier. Sony’s VAIO T Ultrabooks start at $769.99 for the 13.3-inch model available now, and Toshiba has announced a 14-inch Satellite U840 Ultrabook starting at $749. While these two laptops meet the lightweight and thinness requirements of the Ultrabook brand (under 0.8 inches thick and weight under 4 pounds), like the IdeaPad U-Series, these Ultrabooks get to the lower price point by using hybrid storage (a small SSD for the operating system and larger traditional hard drive for everything else). Otherwise, both Ultrabooks sport aluminum casing and an array of full ports including USB 3.0 and HDMI. The Satellite U830 adds a backlit keyboard and HD display, while Sony points out the VAIO T’s 7.5-hour battery life. Prices on other Ultrabooks are finally fulfilling tech prophesies and dipping to $599 and below--perhaps low enough to give mainstream laptops a run for their money. Ultrabook News reports than an Asus S46 14-inch Ultrabook will start at $599 while a 15-inch S56 will be priced at $799. The Asus S56, though weighing in at a less portable 5.07 pounds, will have a few high-end options including: Intel Ivy Bridge Core i5 or i7 processors, an NVidia GeForce GT630M graphics card, and hard drive options of 256GB SSD or 1TB HDD. Here’s an informal hands-on with the S56, courtesy of ndeviltv. With Ultrabook starting prices dropping, these laptops may finally find their place among the masses. There will still be more expensive Ultrabooks with more innovative or high-end features to choose from, but it's nice that there are options for more affordable Ultrabooks now too.